Avalokiteshvara is the Bodhisattva of Compassion, known as Chenrezig in Tibetan. He is the “Lord of the Snow Mountains” who made a sacred vow to liberate the sufferings of all beings to attain complete liberation. In this group practice, we enter into the Meditation of Great Compassion with its six-syllable mantra “Om Mani Padme Hum”. March 15 – 17 in Santa Fe! The most profound & fundamental teaching of the Sakya Lineage: The Three Visions refers to the three views. It examines the state of those experiencing suffering, those engaged in the methods leading towards freedom from unhappiness and misery, and those fully enlightened ones who have attained the highest goal of awakening. A step-by-step process culminating in ultimate peace. Khenpo Thupten Gongphel became a monk of the Sakya Order in 1984, when he joined the Sakya Centre in Dehradun, India and took his novice vows. He completed the Sakya curriculum of Tibetan grammar, Buddhist rituals & scriptures.He took his full monks’ vows in 1990. In 1997, he joined the Sakya Institute at Puruwala. In 2004, he obtained his Kachupa Degree (Buddhist Philosophy, B.A. ), and his Lopon Degree (Buddhist Philosophy, M.A.) in 2006.He spent the next two years teaching Buddhist Philosophy at the Sakya Institute. In 2008, Khenpo joined the IBA (International Buddhist Academy, Kathmandu, Nepal) Monastic Leadership Program. There he learned English & Mandarin Chinese, while teaching Buddhist Philosophy in English to foreign students during the Summer Courses at the Academy. He served as monastic disciplinarian during his last two years there. He is qualified to act as a translator and interpreter in Tibetan, English, Mandarin Chinese & Hindi. Khenpo is known as a genuine monk of the Sakya Order of Tibetan Buddhism, and a person of excellent moral character and standing. His title of “Khenpo” was bestowed by H. H. Kyabgon Gongma Trichen Rinpoche, The 41st Sakya Trizin, in 2016. He is the resident lama at the Minneapolis Sakya Center. 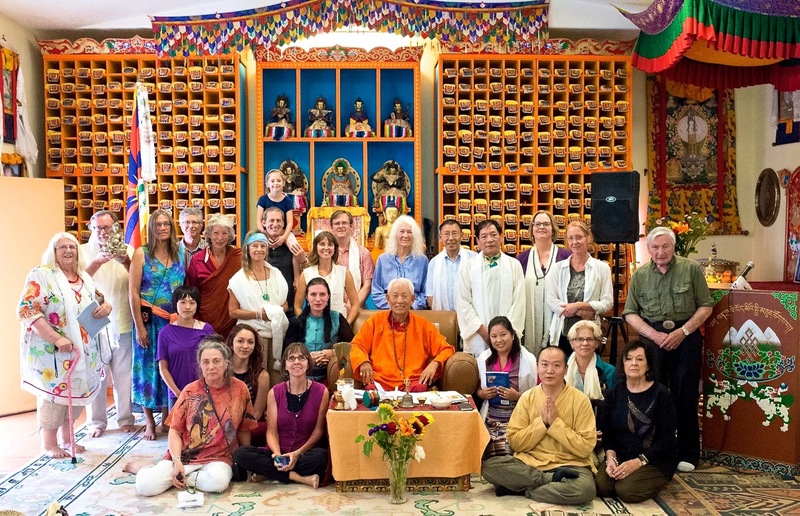 We welcome Khenpo on his second visit to Santa Fe! Thank You Khenpo Pema Wangdak! Brief Biography of Khenpo Pema Born in Purang, Western Tibet in 1954, Khenpo Pema Wangdak’s family escaped from Tibet in 1959, and resettled in Mundgod, South India. He is the only child of five to have survived the escape. He has been a monk since the age of 7. 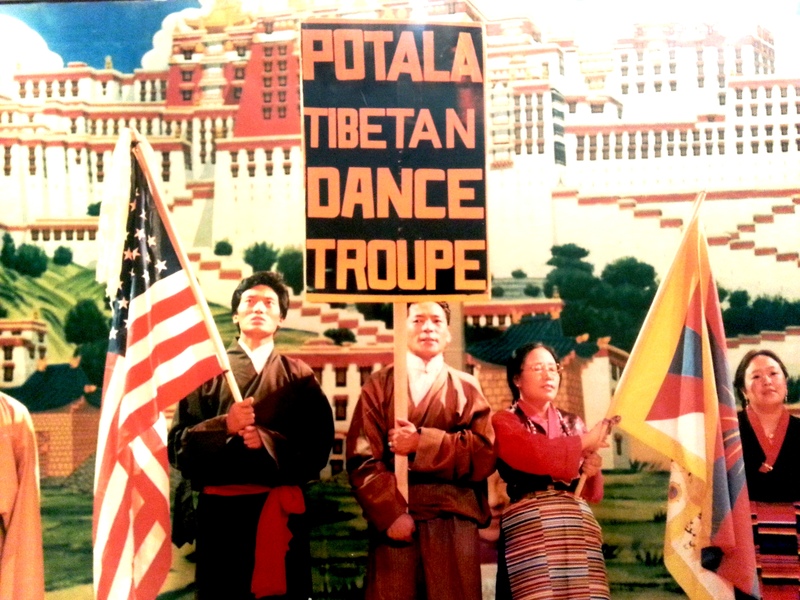 In 1982, he was sent to the West by His Holiness Sakya Trichen, as the first of the younger generation of Tibetan teachers in America from the Sakya School. He is the creator of “Bur Yig”–Tibetan Braille. He is also the founder of Pema Ts’al (“Lotus Grove”) Schools in Mundgod, India (for Tibetan lay children); Pokara, Nepal (monastic schools for boys); and Pema Ts’al School in New York City (with a curriculum modeled on that of Sakya College, India). He was recognized with the title of “Khenpo” by H. H. Sakya Trizin in 2007. He received the distinguished “Ellis Island Medal of Honor” award by the National Ethical Coalition of Organizations in May, 2009 at Ellis Island for his humanitarian work around the world and is the first Tibetan ever to have received such an award. He has been guiding Western students for over 30 years. H.H. 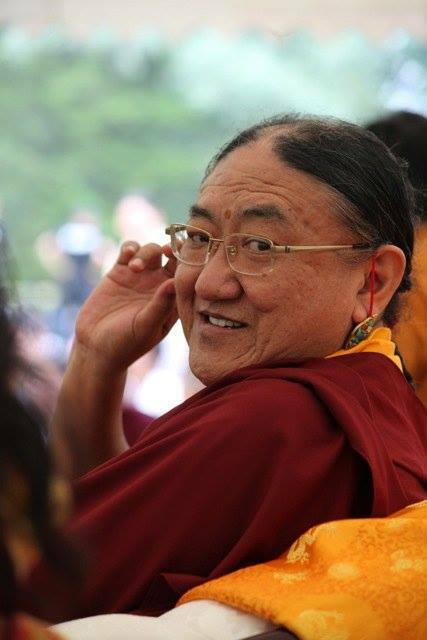 Sakya Trichen Rinpoche a Happy 74th Birthday! Among Tibetan male spiritual adepts, many have the title of Jetsun or one worthy of honor, such the famous 11th century yogi–Milarepa. However, few Tibetan female spiritual practitioners are honored with this title.One of the more famous is the yogini Shugsep Jetsun (1852-1953). Excerpts from Tibet’s rich heritage, which began with its first king Nya-khri bTsanpo in 242 B.C. He became ruler and unified Tibet’s twelve large and forty small kingdoms under one king (bTsanpo). The entire Tibetan region was unified, and continued as such for 1084 years until 842 A.D. In total, 42 Tibetan bTsanpo ruled during this time. Our kings were great military commanders of Tibet at the time of the three super powers in Central Asia (Tibet, India and China) from the 7th to 9th century. During that time, Songtsen Gampo was the 33rd Dharma king of Tibet, who created Tibetan written language and married both Nepalese and Chinese queens. He moved the capital to Lhasa and built the Potala Palace. Many Indian Buddhist scholars were invited to Tibet to translate texts from the five Buddhist sciences. He began the sNgags-pa Monastery at that time. By the 11th century, Tibetans were more interested in Buddhism than military conquest and three major sects developed: Kadam (by Atisha), Kagyu (by Marpa) and Sakya (by Khon Konchok Gyalpo). At that same time, the Bonpo sect (by sTonpa Shanrab) already had extensive followers over the whole country. In the 13th century, the Sakya leaders (Ponchen) impressed Mongolian Khans with their deep understanding of Buddhism. This deterred the Khans from conquering Tibet. One of the most significant leaders was Chosgyal Phagpa who not only became the lama for Mongol Kublai Khan, the first emperor of China, but the lama for the entire nation of China. From that time onward, the Sakyas continued to rule Tibet for one century. Until 1353 A.D., twenty Sakya Ponchens ruled the entire three Tibetan cholka provinces. Starting in 1354 A.D., the Phag-gru sDe-srid ruled Central Tibet for the next 264 years until 1618 A.D. In 1642, the Fifth Dalai Lama became the ruler of the entire Tibetan three cholkas. From the Fifth Dalai Lama up to the Fourteenth Dalai Lama, ten Dalai Lamas ruled Tibet until 1959. This will be discussed in the next sessions. Nima Dorjee is a scholar and specialist in Tibetan art and Tibetan history. He worked as researcher and scholar at the Jacques Marchais Center for Tibetan Art, Staten Island, NY and his research at the Center resulted in a highly acclaimed book on Tibetan art history, Treasures of Tibetan Art, published by Oxford University Press. Also serving as a consultant for the valuable Tibetan collection at Newark Museum, NJ he participated in producing Tibetan Sacred Art Video as well as a popular special exhibit on Tibetan culture and art.Throughout his scholarly career, he received grants including the JD Rockefeller III grant, NEH Travel to Collections grants, Luce Foundation grant, Tibet House grant and Asian Cultural Council grant.He continues to serve as Vice President of Tibet Center in NYC since its inception.Currently he is writing a comprehensive history of his natal state of Dagyab in East Tibet and has presented some aspects of his research at several international conferences in Europe and North America. for Your Teachings in July! Avalokiteshvara is the Bodhisattva of Compassion, known as Chenrezig in Tibetan. He is the “Lord of the Snow Mountains” who made a sacred vow to liberate the sufferings of all beings to attain complete liberation. Through this empowerment ceremony we may enter into the Meditation of Great Compassion with its six-syllable mantra “Om Mani Padme Hum”. This empowerment could also have been taken as a blessing. Your Kind Return to Santa Fe after four years. Please Live Long for the Benefit of All Beings! Deep Learning Experience & Cultural Exchange! in unison towards a common goal. Thanks to all who helped bring this event together! Happy 83rd Birthday to H.H. the Dalai Lama! With sincere appreciation …We thank you! Chokhor Duchen is one of four great holy days of the annual Tibetan Buddhist calendar, taking place this year on July 27th. It commemorates the anniversary of Shakyamuni Buddha’s first teaching of the Dharma. Following His Enlightenment, the Buddha did not immediately teach. Then, Indra and Brahma offered a Conch Shell and Dharmachakra, entreating Him to please turn the Wheel of Dharma. Buddha Shakyamuni accepted and gave his first discourse on the Four Noble Truths at Sarnath. Saturday, May 6, 2017 at 11 a.m. This occurs on the full moon (the fifteenth day) of the first Tibetan month. Starting with the New Moon at Losar, this time celebrates the fifteen days on which Buddha displayed a different miracle to increase the devotion of disciples. It is said that karmic effects are amplified ten million times. 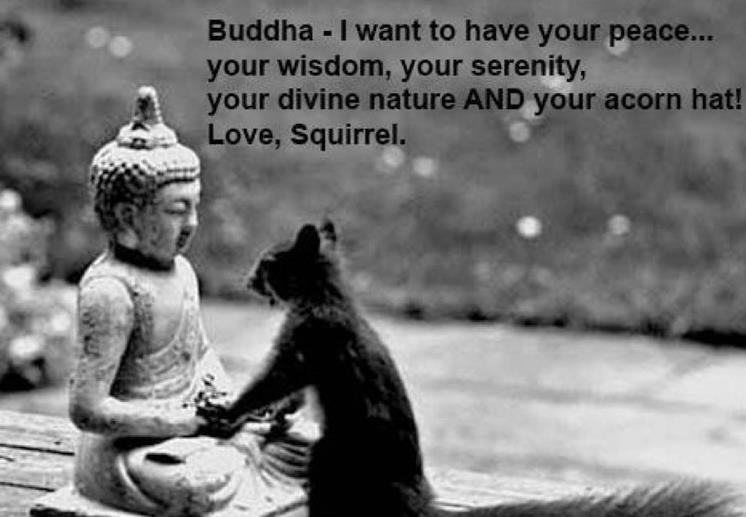 Here is an Auspicious Prayer for you…May All Beings be Happy! During his 41st year, Buddha ascended to Tushita heaven to benefit his mother, Queen Mayadevi, who had died seven days after his birth, and had been reborn there. To repay her kindness and to liberate her from samsara, he spent the rainy season retreat teaching her and other gods the Abhidharma. After three months he descended on a triple staircase from the heavens. Lhabab Duchen commemorates this descent from those heavenly realms. It is one of the four major Buddhist holidays of the annual calendar. Brief Biography: Lama Choedak was born in Tibet and escaped to Nepal in the early 1960s. He has taught in many Buddhist centers worldwide and translated for some of the greatest living Buddhist masters. He completed a three-and-a-half-year retreat under H.E. Choegye Trichen’s guidance. Lama Choedak Rinpoche’s explanation of meditation and its everyday relevance is renowned for its lucidity, authenticity and humor. His teachings are offered from the heart, spiced with the richness of experience, dedication and realization. A post-graduate of Australian National University, he is the author of Lamdre: Dawn of Enlightenment, Healing Relationships, The Triple Tantra, A Textbook of Tibetan Language, The Clear Mirror and more. 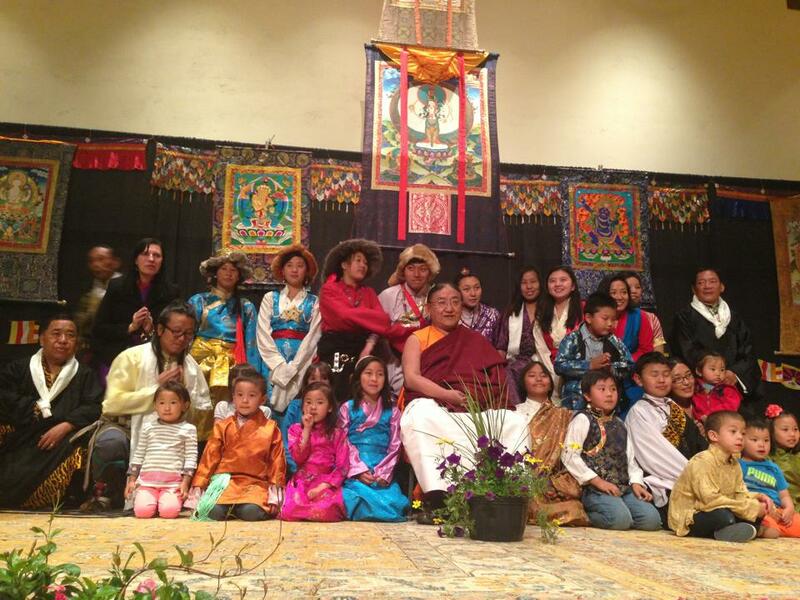 Thank you for your first visit to Tsechen Namdrol Ling & Santa Fe, NM! “Saga Dawa” is the Commemoration of Three Events in Buddha Shakyamuni’s Life: His Conception, Attainment of Enlightenment & Parinirvana. 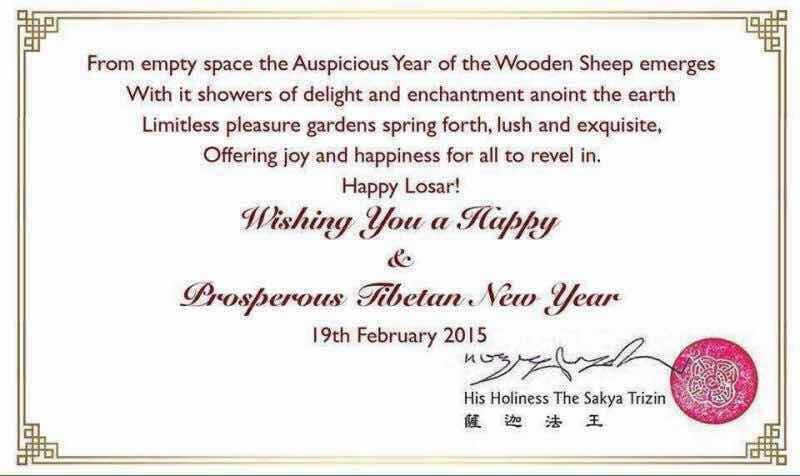 All took place on the full moon day of the fourth Tibetan lunar month, but in different years. 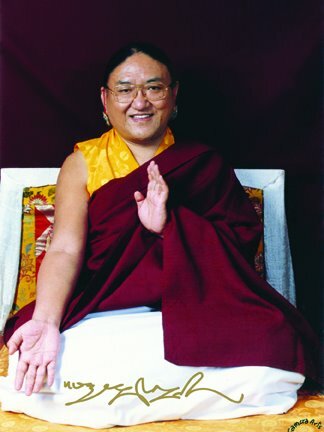 Sakya Pandita (or Sapan) was the Fourth of the Five Founders of the Sakya Lineage. He was born in 1182 at Sakya, Tibet. As a child, he knew Sanskrit without being taught. As a teen, he recalled the teachings of the Abhidharmakosha from a previous life. Sakya Pandita was most excellent in debate and writing. He was the author or more than 100 texts, and was a prolific translator from Sanskrit. He became known as a great scholar in Tibet, Mongolia, China and India and was proficient in the five great sciences of Buddhist philosophy, medicine, grammar, dialectics and sacred Sanskrit literature as well as the minor sciences of rhetoric, synonymies, poetry, dancing and astrology. His teaching legacy reached far and wide, and His perfected Wisdom is revered by all sects of Tibetan Buddhism. Medicine Buddha (Tibetan: Sang-gye Men-la) Alleviates suffering, sickness, and injury. One of the most important practices for healing oneself and others. Holding a medicine bowl with its healing rays of energy to all beings, this blessing prolongs life and improves the opportunity to attain enlightenment. White Mahakala (Tibetan: Gon-po Yi-Shin Nor-bu) This Wealth Deity is known as “The Wish-Fulfilling Tathagata Gem”. The six-armed protector assists with all kinds of material and spiritual prosperity, bestows wealth, and liberates into a state of Buddhahood. Avalokiteshvara (Tibetan: Chen-re-zigs) The “Lord of the Snow Mountains”, Avalokiteshvara, made a vow to liberate suffering of all beings. Through this empowerment we enter into the meditation practice of Great Compassion with its sacred mantra from Tibet ~ “Om Mani Padme Hum”. Red Tara (Tibetan: Drolma Marmo) One of the 21 Taras, the Mother of All Sentient Beings, whose wisdom is beyond form, sign or description. Red Tara is particularly beneficial for removing obstacles, increasing wealth and longevity. Her red color symbolizes the activities of magnetizing and power. Lama Kunga Thartse Rinpoche was born in Tibet in 1935. He is the son of Tsipon Shuguba, the last Treasurer of the Dalai Lama’s government in Lhasa. At the age of seven, he was recognized as the reincarnation of Sevan Repa, the heart disciple of the great Tibetan sage Milarepa. 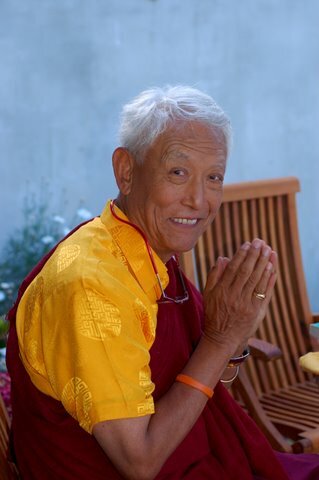 Rinpoche entered Ngor Monastery at age eight and was ordained at sixteen. At the time of his escape from Tibet in 1959, he was the Thartse Shabdrung (vice-abbot) of Ngor Monastery in the Sakya tradition. Lama Kunga came to America in 1962; and has been the resident teacher at Ewam Choden Tibetan Buddhist Center, Kensington CA since 1972. He has given extensive teachings in New Jersey, Washington, D.C., Wisconsin, Minnesota, Oregon, Utah, Arkansas, Florida, California, Hawaii, New Mexico, Brazil and Costa Rica. Rinpoche has authored two translations of Milarepa’s stories: Drinking the Mountain Stream & Miraculous Journey (with Brian Cutillo, Lotsawa); In The Presence of My Enemies: Memoirs of Tibetan Nobleman Tsipon Shuguba (with Melody Sumner Carnahan, Clear Light Publications, Santa Fe). If you grasp at the view of ultimate reality, you don’t have the right view. This four-line teaching includes the whole of the Mahayana path within it. The transmission of this teaching from teacher to disciple is unbroken till this day. It is similar to preliminary teachings from the other Tibetan Buddhist lineages; although the names may be different, the teaching is the same, incorporating the practices of the Path of the Transcendent Perfections. then a birthday dinner and dedication took place that evening. 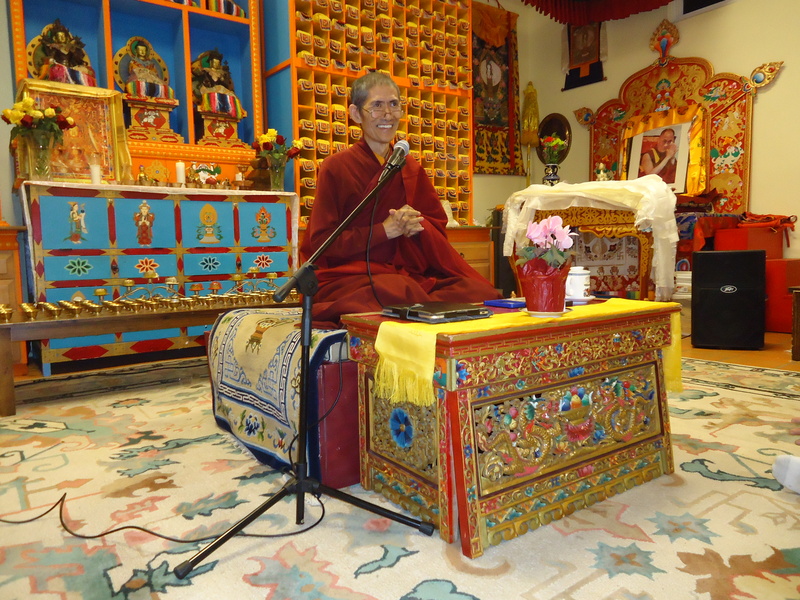 We offer our sincerest thanks to Lama Jay for the teachings he gave on “The Six Perfections” ~ giving, moral conduct, patience, diligence, meditation and wisdom; he also explored what these six perfections mean and how to practice them. “The Sage’s Intent” & Rongton Sheja Kunrig were referenced; “The Practice of the Three Bodhisattvas” ~ Manjushri, Avalokiteshvara, and Vajrapani embody wisdom, compassion and skillful means. Through the perfect accomplishment of these three qualities we are able to benefit countless beings; and in the Meditation Practice of the “Rigsum Gonpo” the actual sadhana practice, explanation & questions/answers were examined by those who had previously taken the empowerment. 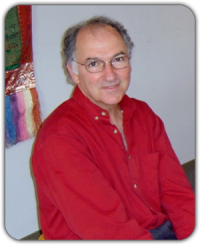 Also known as Ngawang Samten, Lama Jay Goldberg is a translator of “The Beautiful Ornament of the Three Visions”, “Mo, Tibetan Divination System”, “The Sage’s Intent”, “The Sutra of Recollecting the Three Jewels” (with commentary by Khenpo Appey) and many translations of sadhanas and rituals. He is a long-time Dharma practitioner who lived in India for 17 years, including 14 years as a monk in Rajpur as a disciple of His Holiness Sakya Trizin. H.E. Jetsun Kushok says of Jay Goldberg: “He is a longtime student of His Holiness Sakya Trizin and has been my personal translator. He is an excellent Sakyapa now practicing in daily life.” Lama Jay Goldberg is the practice director at Sakya Dechen Ling, HE Jetsun Kushok Chimey Luding’s center in the Bay area. Taking Refuge is the first practice of Buddhism, and the foundation of all subsequent practice. It distinguishes Buddhists from non-Buddhists, but whether one practices Buddhist teachings or not is an individual choice. Transmission from the Teacher is particularly important in the Tibetan tradition. We need guidance for our practice. For receiving teachings, any qualified Guru is good, but there is a special one who can help you more than any other. 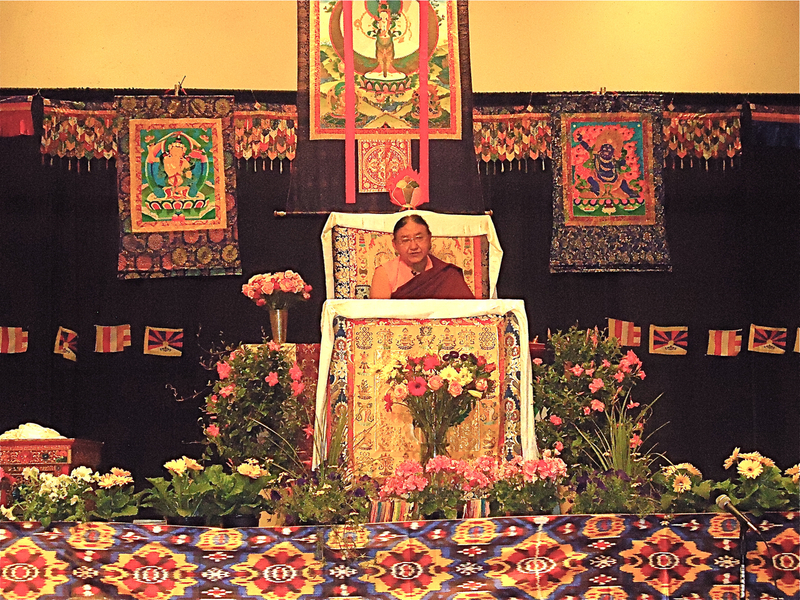 His Holiness Sakya Trizin’s first visit to Santa Fe was a very auspicious occasion. He bestowed the “Rigsum Gompo” or combined Empowerment of the three principal Bodhisattvas: Manjushri, Avalokiteshvara and Vajrapani. In this traditional ceremony, we were introduced to the energetic principles of Wisdom, Compassion and Power to be actively utilized to transform one’s daily life. The initiation was taken as a blessing or used for personal meditative practice, and is suitable both for beginners or those with experience. The effectiveness of these methods in developing one’s awareness cannot be overestimated. This was an extremely rare opportunity to receive an authentic, unbroken transmission of teachings from a great Master from the Sakya Tradition of Tibetan Buddhism. 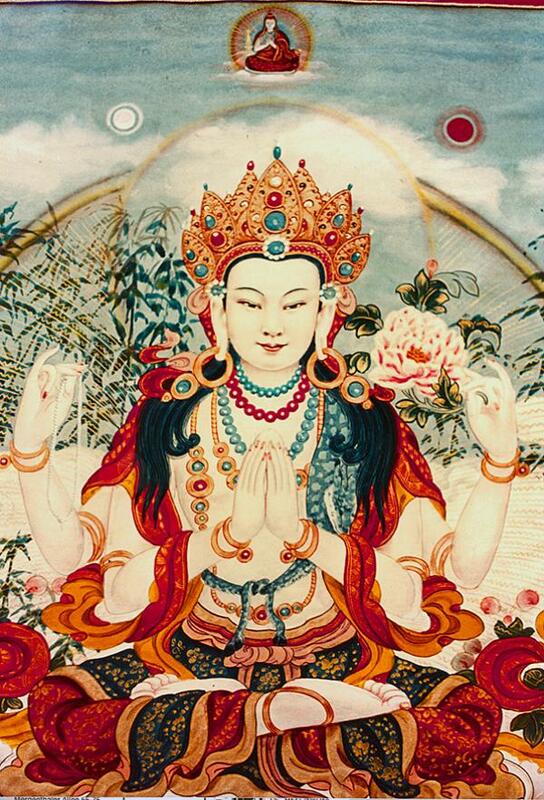 Avalokiteshvara is the Bodhisattva of Compassion, who emanates from Buddha Amitabha. He made a vow to liberate the sufferings of beings in all realms to attain complete liberation. His hands hold a wish-granting gem, rosary and lotus. Known as the “Lord of the Snow Mountains”, the Potala is his residential paradise. The first and most widespread Buddhist mantra in Tibet is Avalokiteshvara’s six-syllable mantra of Great Compassion “Om Mani Padme Hum”. In China he is known as Kuan-yin, and in Japan as Kannon. Manjushri is the Bodhisattva and living symbol of Knowledge; and the embodiment of Prajna or Transcendent Wisdom. With indispensable virtues on the Mahayana path of perfection, he is an emanation of the Buddha Vairochana. In his right hand is a blue flaming sword of Discriminating Knowledge; while his left carries the Prajnaparamita or book of the Perfection of Wisdom. Manjushri represents the realization of transcendent wisdom which cuts through ignorance and duality. Ri-wo Tse-nga or the Five Sacred Peaks are regarded as his secret residence (Wu-tai Shan). Vajrapani is the holder of the Thunderbolt Scepter, the symbol of the Power of compassion. An emanation of the Buddha Aksobhya, Vajrapani is regarded as the Destroyer of Obstacles. With his right hand holding a golden-pronged Vajra, he accomplishes fierce determination and unrelenting effectiveness against negativity. As our ego-grasping is disintegrated, we gain power, strength and courage in times of adversity. Vajrapani is also venerated in the Shaolin and Pure Land traditions; and in Japan as the Dharma protector(s) known as Nio. Thank You to H.H. Sakya Trizin! Tsechen Namdrol Ling on the afternoon of May 6, 2014. Удачи и эффективного развития вам!